The expected announcement of Alan Pardew as Crystal Palace manager has been delayed by paperwork, according to caretaker boss Keith Millen. 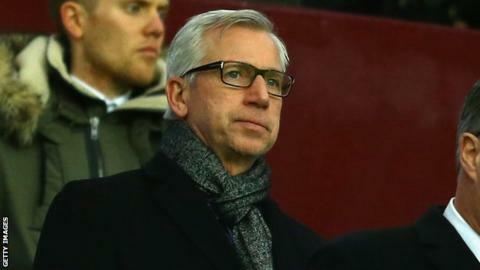 Pardew, 53, is set to move to Palace from Newcastle United and was in the stands to watch the London club draw 0-0 at Aston Villa on Thursday. Millen said: "They're still talking but there are no problems. "The lawyers are finalising the contract. The paperwork is taking longer than expected." Millen says Pardew, 53, is helping to prepare the team for Sunday's FA Cup third-round tie against Conference side Dover Athletic. "Alan has held a staff meeting when he spoke about a number of things," Millen said. "He spoke to the players and then we had training. "We're preparing for the game on Sunday and I'm sure Alan will be taking the game. He'll be taking training on Saturday. We're hopeful the deal will be done for Sunday." Pardew will take over a side in the Premier League relegation zone, with the point at Villa not enough to take them out of the bottom three. Palace are without a win in eight league games - a run dating back to the 3-1 home win over Liverpool on 23 November. However, they have claimed two points from their last two games.